Through the efforts of Frank Fetch and other members of The German Village Society, a piece of ground on Beck Street was acquired by the City of Columbus in 1962. A house that once stood on the site was raised and the 0.2 acre park was developed by Parks crews. The work was completed and the park opened in 1966. The park was developed by Park Landscape Architects along the lines of a 19th Century “Bier Garten” of Germany with walls, pavements, flower planters, extensive landscaping and decorative gas lights. Picnic tables were added for passive use and special uses such as art exhibits were encouraged. The local residents helped with the maintenance for many years. On January 23, 1985, the park was renamed to “ Frank Fetch Memorial Park” to commemorate Frank’s role in establishing the park and honor him as “The Father of German Village.” The park serves as a fitting, visible and lasting tribute. In addition to Frank’s role in the “ German Village movement” he once served as Superintendent of Parks for the City of Columbus. Local residents always helped with park maintenance. German Village Garten Club funds the park from the proceeds of their annual Garten Markt Sale. In 1962, there was a barren 0.2-acre lot void of trees and vegetation on Beck Street in historic German Village. The city demolished a saltbox house and had a “bier garten” style park created by building brick walls, a brick pavement, and some decorative gas lighting installed. Years of neglect inspired Mayor Westlake to encourage the German Village Society to convert this small empty lot into a “pocket park.” The Society renamed the Park from Beck Square to reflect the founder of the German Village Society – Frank Fetch. 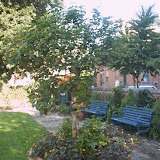 And then, the German Village Garten Club was asked to develop and maintain the park, with the cooperation of the City. The design is similar to the social gartens of Munich. In 1996, the German Village Garten Club created a master plan for enriching the beautification and usefulness of the Park. The Club sought out donations and commenced investing in a significant revitalization of the Park space with the cooperation of the City’s Division of Recreation and Parks. But the magic of what has transformed today is due to the Friend’s of Frank Fetch Park arousing the interest and fun in gardening. Their enthusiasm inspired Garten Club members and friends in the neighborhood and led to the creation of the Friends of Frank Fetch Park workgroup that oversees seven days a week the entire maintenance and planting requirements. Today, Frank Fetch Park is a “gold star” in the German Village Garten Club’s history. The vision and groundwork established by Garten Club members in 1996 has now resulted in this Garten being one of the most used 0.2 acres in Franklin County. How do the Friends of Frank Fetch Park creatively use a small lot so that it will be functional, horticulturaly beautiful, and customer friendly? How do they design the diverse plantings to be pleasant to people’s eyes, and be a welcome site for our numerous neighborhood dogs? First, the daily caretakers handling the deadheading and watering chores are continually making friends with the pet owners and inspiring hem about the park’s beauty. Doggie bags and a drinking bowl are available for our dogs’ visits. y working with one pet owner at a time, and one dog at a time, the volunteers have nurtured a support for the park among many two and four-legged visitors that is unparalleled to many other urban parks. Gas lights, hanging baskets, brick walkways, and wrought iron fencing give the park an “old world” feeling. Numerous benches and picnic tables make it inviting for neighborhood and visitor use. But this quaint “pocket park” creates challenges from spring through fall. The lushness of the park is a result of hand mowing, hand trawling, hand planting, hand clipping, hand watering, and hand fertilizing. The Friends of Frank Fetch Park are dedicated servants who never give up ensuring the Park is an enhancement in our community. Frank Fetch Park has been a “full sun” park with intimate pockets of shade. However, visitors were unable to sit in shaded area until the Garten Club constructed a pergola this year over top the picnic tables. This large structure has accentuated the entire look of this special garten. Throughout each of the four seasons, the park’s usage has increased because of this network, and because the Garten Club is continually monitoring it to ensure year- round German Village tourists are pleasantly welcomed by the Park’s natural beauty. Frank Fetch Park has become a wonderful resource for gardeners to learn about new plants they might use in their own garden. People have not only donated their time but have contributed park benches, plants and supplies to the park along with monetary contributions in honor of a family member. We are daily visited by artists and photographers, workers on their lunch break, joggers and walkers looking for water and a place to rest, families enjoying a picnic or evening strollers on the way to and from dinner. Even during the winter months the park is decorated for the Holidays and the official Village Tree Lighting is held the first Friday in December. In 2002 and 2003, the Garten Club joined with the German Village Society to promote tour groups from all over the Midwest to visit Frank Fetch Park. In addition to this Park, Huntington Gardens and the Topiary Park are also included in our community tour to share our love for landscape architecture and plant materials. Over 6,000 visitors have taken advantage of this tour in 2002. Frank Fetch Park has become a gathering place for Village residents to meet and enjoy a tranquil setting. The park’s convenience, comfort level, peacefulness, and beauty have resulted in praises being given each day to the volunteers. This park seemed to be an “impossible undertaking” in 1985; however, with the leadership of the German Village Garten Club and specifically the Friends of Frank Fetch Park, this Park is now a dream come true that truly inspires others to create a greenspace near or at their home.